The Civil War was often called the “Brother’s War” because it pitted states, towns, villages, and even families against each other. For example, Abraham Lincoln’s wife, Mary Todd Lincoln, had three brothers who fought for the Confederacy and were killed. Many of the soldiers and officers for both sides had attended West Point or other military schools. They felt torn between their loyalty to the Union and their loyalty to their families or communities. Abraham Lincoln, a poor farm boy from Kentucky, grew up to become a lawyer, and later the President of the United States during the Civil War. Although he hated slavery, he believed the Constitution didn’t give him power to do away with slavery. Jefferson Davis had served as a senator, congressman and U.S. secretary of war. He didn’t want the South to secede from the Union, but accepted the position of President of the Confederacy when asked. Ulysses S. Grant became Lincoln’s right-hand man and commander of the Union armies. He was slow and methodical in his strategy. Critics called him “Butcher Grant,” believing he deliberately forced troops into deadly situations in his effort to bring an end to the Civil War. Robert E. Lee was an officer in the U.S. army who hated slavery and opposed secession. President Lincoln asked him to lead the Union troops but he declined and became the commander of the Confederate army instead. He said that he could not be disloyal to his birthplace, home, and children. Lee was a sly and clever military strategist. William Sherman was born in Ohio and oversaw a Louisiana military school. Yet, when the Civil War began, he enlisted in the Union army. He suffered from depression during the early days of the war, but later became one of Grant’s best leaders. Stonewall Jackson grew up in Virginia and became a courageous, honorable leader for the Confederacy. During the first battle, an officer commented on Jackson, standing firm and strong like a “stone wall,” which is where he got his nickname. Question: What happened to Civil War leaders after the war? Answer: Abraham Lincoln was assassinated just five days after the Civil War ended; Ulysses S. Grant went on to became U.S. President. General Robert E. Lee was pardoned by Lincoln for his role in the Civil War, but his life wasn’t easy. His estate in Arlington, Virginia became the site of a cemetery for Union soldiers. He took a low-paying, obscure job as president of Washington College. He felt deeply wounded by the part he had played in the divisive and bloody war. In 1865, he signed an oath, asking to become an American citizen again. He did this partly for himself and partly as an example to other Confederate soldiers. He wanted to restore peace to his country. Unfortunately, the oath was misplaced and he died without regaining his citizenship. The oath was discovered 100 years later in the National Archives. In 1975, President Ford declared General Lee a citizen once again. Stonewall Jackson died in 1863 from pneumonia, after being accidentally shot by his own troops. William Sherman became the general of the U.S. Army. He later retired and led a quiet life. Visit Civil War Trust to watch a video about the Civil War leaders. Declan, Tobin. " 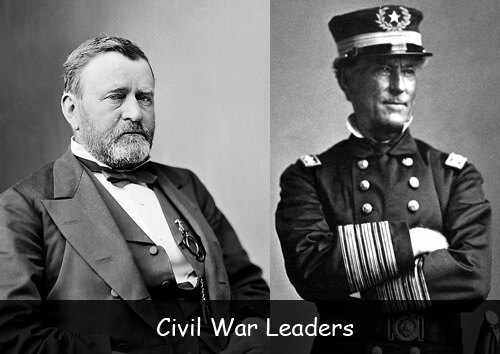 Facts about Civil War Leaders - American History for Kids ." American History for Kids, Apr 2019. Web. 22 Apr 2019. < https://www.americanhistoryforkids.com/civil-war-leaders/ >.